Dramatic and varied scenery make this Ladakh's most celebrated trek. The itinerary was well planned - we had plenty of time to acclimatise in Leh before the trek. Accommodation in Delhi and Leh very good, great food and friendly service. Our guide was outstanding - the best we have had - his knowledge of the culture and wildlife was unrivalled. Our guide knew everyone in the Markha Valley and was extremely knowledgeable about the culture, flora and fauna. Personal service when we emailed or phoned. Efficient pick-ups etc.during the trip. No compromises on quality. The Markha Valley epitomises the best of this scenery and is perhaps Ladakh’s most celebrated trek. It has giant rock pinnacles, spectacular cliffs, narrow defiles, prayer-flagged passes and evidence of a much older civilisation, the history of which has been lost in antiquity. As you trek up the valley, there are the ruins of many forts and castles, some built in the most unlikely of places, whilst the many monasteries and gompas that are still central to the lives of the Ladakhi people, illustrate the deep Buddhist heritage of the region. Before the trek begins, there is plenty of time to acclimatise whilst exploring the sights and sounds of Ladakh’s ancient and modern capital, Leh. You will then spend a further day visiting the major cultural attractions of the Indus Valley including Shey Gompa and Thikse Monastery. This departure also has a day enjoying the Hemis Festival - a large, vibrant, Tibetan Buddhist Festival full of sound and colour. Your trek begins by driving up the Zanskar River gorge to the village of Chilling. From here there is an exciting river crossing on a jola (suspended basket and pulley system) before you begin trekking up the Markha valley. This route offers the best acclimatisation as it avoids having to make the demanding crossing of the Ganda La. You now have three fabulous days walking up the valley, gradually gaining altitude, passing by villages, occasionally wading through shallow streams, admiring the awesome cliffs and canyons. You then gradually climb to Nimaling to find yak herders grazing their animals in the wide verdant pastures. From here you can look across to the towering summit of Kang Yatse and the other peaks of the Zanskar range. Finally, you will cross the Kongmaru La, the highest point of the trek at 5,216m/17,113ft, before descending back down into the Indus Valley and the village of Sumdo, near Hemis. You drive back to Leh for a well-earned rest and celebration of your achievement. The Markha Valley Trek represents a great value ‘classic’ trek and provides a superb opportunity to enjoy a Himalayan trek in the summer months. We can offer a private departure of this holiday in India for a minimum of two people sharing. Prices from £1,895 per person, Land Only. International flights available from £550. The 7th July departure attends the Hemis Festival. The 28th July departure attends the Phyang Festival. Meal arrangements: Bed and Breakfast in Delhi, all meals included in Leh, on the drive and on trek. Sightseeing in Indus Valley visiting Thikse and Shey monasteries. Attend a festival (Hemis Festival 7th July departure, or Phyang Festival on 28th July). Time at leisure. Drive to Chilling, visit Likir Monastery. Trek to Skiu. Trek to Markha. Trek to Hangkar and trek to Nimaling. Trek to Chogdu across the Kongmaru La Pass, 5,216m/17,113ft. Trek to Sumdo. Drive to Leh. Fly to Delhi and on to London. Your leader will be a knowledgeable, English speaking guide, most likely from Ladakh. 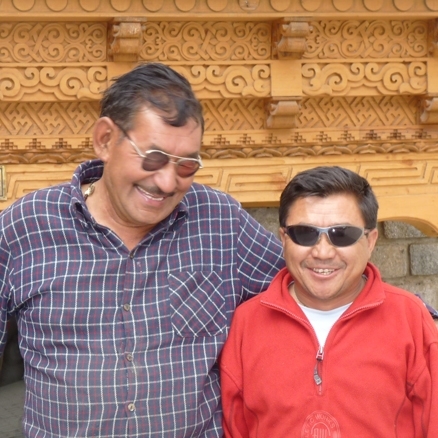 However, sometimes Sherpas come over from Nepal in the summer season and you may therefore have a Nepalese guide. In addition to helping you get the most out of your visit to Ladakh and taking care of you, your leader will co-ordinate all your arrangements, ensuring that everything runs as smoothly as possible. Day 1 - Fly London to Delhi. Day 2 - Arrive Delhi. Group transfer to hotel. Half day sightseeing tour of Qutab Minar. You will arrive in Delhi in the morning and you will be met and transferred to your hotel which is situated not far from the airport. Although Delhi can still be quite a culture shock, it is nowadays a vibrant and cosmopolitan modern city with thriving business areas, an excellent metro system and plenty of reminders of its exciting history and ancient civilization. In the afternoon, you will have a sightseeing tour. You will visit Qutab Minar, a 73m high tower built in 1193 by Qutub-ud-din Aibak to celebrate his victory over Delhi's last Hindu King. It is considered to be one of the finest monuments in India. Our local representative will let you know details of your flight to Leh tomorrow and will arrange an early breakfast for you, if you wish. Day 3 - Fly to Leh. An early morning transfer to the domestic terminal of the airport for the flight north to Leh. This surely is one of the most sensational scheduled flights in the world, taking you right over the Greater Himalaya before dropping in a series of steep turns to land at the small military airport at Leh; flight time about 70 minutes. You will be met on arrival and driven through Leh to check into your hotel. Leh is 3,505m/11,500ft above sea level and therefore we recommend that the rest of the day is spent resting to help you adjust to the altitude. Day 4 - Half day sightseeing in Indus Valley visiting Thikse Gompa and Shey Palace. Afternoon at leisure. Today you will be taken in jeeps to see some of the largest monasteries and palaces in the Indus valley. You will visit Thikse Gompa and Shey Palace. The 500-year-old Thikse monastery, perched on a hill high above the Indus, has the largest contingent of monks in Ladakh. On the right of the entrance to the main courtyard a new chapel houses an enormous 15 metre high figure of Chamba, Buddha of the Future. About 100 yellow-cap monks belong to the gompa. If you get there by 6.30am you can witness the daily morning prayers but there are also prayers closer to noon, preceded by long, mournful sounds from the horns on the roof. Located 15km from Leh, the old 'summer palace' of the kings of Ladakh was built about 550 years ago by Lhachen Palgyigon, the first King of Ladakh. From the palace you can see over the fertile Indus plain north east to Thikse Gompa and over the Indus to the Zanskar mountain range. The old Shey Palace has the largest golden Buddha statue in Ladakh in its gompa. The 18th century statue worked out of gold and gilded copper sheets stands 12m high and has blue hair. The most important moment in the construction of such a figure is when the eyes are painted in and the statue can 'see'. No artist, or monk would dare to look the Buddha in the eye, so the pupils are painted over the artist's shoulder, with his back to the idol, using a mirror. Day 5 - Day at leisure in Leh (June departure visits the Hemis Festival). Here is a chance to further relax in the relative luxury of Leh and do some sightseeing and exploring. Leh is very Tibetan; the national dress, 'stove-pipe' hats and felt boots with turned-up toes are much in evidence. The Royal Palace, which dominates the town, is strongly reminiscent of the Potala in Lhasa and Tibetan Buddhist monasteries, large chortens, prayer flags and mud brick houses with flat roofs are a dramatic culture change from the hot, teeming frenetic rush of Delhi. The centre of Leh is just a short walk from your hotel. Visit the bazar with its many stalls and handicraft shops while the Tibetan market offers goods from all over the Himalayan region. You can also visit the Ecological centre where you will discover from various exhibits how a relatively fragile Ladakhi culture is being threatened by a rapidly changing outside world. Before returning to your hotel you could relax in town at a rooftop café, or do a bit of shopping. Leh has some good bookshops. This departure will visit the Hemis festival. Festivals are a highlight of the year for Ladakhis. They provide the excuse to dress up, socialise, drink, have fun and at the same time earn religious merit. The Hemis Monastery is the largest and richest monastery in all of Ladakh.The Sacred Dance Dramas or 'Chhams' are at the centre of the celebrations where monks in incredible costumes perform elaborate highly choreographed dances to an accompaniment of drums, cymbals and horns. Dancers act out the destruction of evil and the illusory nature of life. Day 6 - Drive to Chilling, 3,350m/10,990ft. Visit Likir Monastery. After breakfast you pack your bags into the vehicles and head out of Leh following the road toward Likir. You pass the turn off to Chilling and continue on to Likir to visit the impressively located gompa here, overlooking the attractive village of Likir. After a packed lunch you continue your drive, initially doubling back, before crossing the Zanskar river and following the winding road beneath steep cliffs up the river valley toward Chilling. Below Chilling you leave the vehicles and climb up the narrow footpath into the village itself where you will camp for the night. It is quite a large village in a beautiful situation above the river. Day 7 - Trek to Skiu, 3,290m/10,794ft - 3-4 hours. After breakfast, there will be a chance to explore Chilling if you have not already done so the night before. Chilling is renowned for its tradition of copper-work; there is a small museum well worth visiting down by the road and you should have the opportunity to see a copper workshop. The road is being extended beyond Chilling, so depending on its development, you may walk, or be driven further up the valley to the river crossing. Here you will cross one at a time by pulley cable-bridge and you meet your ponies and pony-man on the far side. The dirt track winds up the valley climbing gradually until you round a bend and the green settlement of Kaya and beyond it Skiu, come into view. The sprawling village of Skiu is very pleasant and whilst the precise location may vary, your campsite is likely to be set amidst poplar, apricot and willow trees. Day 8 - Trek to Markha, 3,750m/12,303ft - 7-8 hours. Today is a very pleasant walk up one of the loveliest sections of the Markha valley. The trail follows the river bed, occasionally climbing up the valley sides, through this dramatic steep sided valley. Woody bushes, roses, poplar and willow trees grow thickly along the river, which is spanned by several plank bridges. Beyond Thinlespa the trail continues eastwards climbing steadily up the valley until a river crossing (have your sandals at the ready) before you enter the picturesque village of Markha. It is worth walking up to visit the fascinating monastery and ruined palace here if you have time. Day 9 - Trek to Hangkar, 3,900m/12,795ft - 6-7 hours. The trail continues eastwards climbing steadily up from Markha and is joined from the south by the trail from Rubering La, one of the routes from Zangla. From Markha the country changes and the warm, relatively heavily wooded section of the lower valley is left behind. As you ascend you will notice that the further you travel up the valley, the smaller and seemingly poorer the villages become and the houses are correspondingly simpler. Between two villages is a ruined fort, the walls of which climb sharply up a crag to an eyrie lookout tower - worth visiting for those with a good head for heights. There are also great views across Upper Hangkar from the ridge towards Kang Yatse, particularly in the evening light. The camp below the twin villages of Lower and Upper Hangkar is distinctly cooler than at Thinlespa. Day 10 - Trek to Nimaling, 4,720m/15,485ft - 8 hours. From Hangkar the trail climbs steadily up the now narrow valley, past villages which appear smaller and seemingly poorer than those in the lower areas. The Nimaling plain is a broad undulating meadow, sloping upwards to the base of the ice-clad Kang Yatse, 6,400m/20,997ft, which dominates the area. Nimaling, with tiny ponds and rivulets flowing all over its meadows, provides pastures in the summer for an astonishing number of animals; yaks, sheep, goats, dzos and horses, not only from the Markha, but also from villages all around. Himalayan marmots and white-tailed hares are seen in abundance and it is not unusual to spot the occasional blue sheep or wolf. Day 11 - Rest day at Nimaling. Today you can relax in Nimaling and enjoy the superb scenery and surroundings. There is the chance to walk to the base camp of Kang Yatze, the highest peak in the Zanskar range, 6,400m/20,997ft. Alternatively you might like to walk up the ridge behind the camp for a birds-eye view of this beautiful valley. Day 12 - Cross the Kongmaru La Pass, 5,216m/17,113ft. Trek to Chogdo, 4,133m/13,560ft - 7 hours. Today you cross to the north of the Markha Valley, climbing to the top of the highest of the three passes, the 5,216m/17,113ft Kongmaru La. From here there are wonderful panoramic views, with snow-capped peaks stretching away as far as the eye can see. On a clear day you can see K2 and many other famous peaks of the Karakoram. The trail from the pass then descends steeply to the head of the Martselang valley past the sulphur springs of Chyushkarmo, and follows the Martselang stream to the village of Chogdo. Day 13 - Trek to Sumdo, 3,880m/12,730ft - 3-4 hours. Drive to Leh. This morning you end your trek by descending the short distance to Sumdo, or Shang-Sumdo. Transport will be waiting here for the two hour drive back to Leh. On the way you will have a chance to visit Hemis Gompa which is one of the largest and most important in Ladakh. It was founded about 350 years ago by Stagtshang Rinchen, who was invited to Ladakh by King Senge Namgyal. Hemis Gompa is renowned for its annual festival at which, every 12 years, the largest thangka in the world is displayed. For those travelling on our June departure, you will drive straight to Leh. Day 14 - Fly to Delhi and on to London. An early start for the short drive to the airport. This is one of the most sensational flights in the world. Within minutes the aircraft flies over a sea of ice-cold peaks and glaciers as it crosses the Greater Himalaya range. On one side can be seen in the distance the peaks of possibly K2, Nanga Parbat, Gasherbrum and on the other side, so close that you feel you could reach out and touch it, is the Nun Kun massif. On arrival in Delhi, you will then continue on to the international airport in Delhi for the return flight to London. Had a great time, had it so hot! Then saw snow, thunder storms but some great views and memories throughout. Personal service when we emailed or phoned. Efficient pick-ups etc. during the trip. No compromises on quality.